The creation of a successful fashion image is often a team effort. Aside from the model and the photographer, the contributions of a talented creative team can elevate your fashion photography from good to great. In this article, we will review the key members of a creative team, and how you can cultivate a reliable crew. 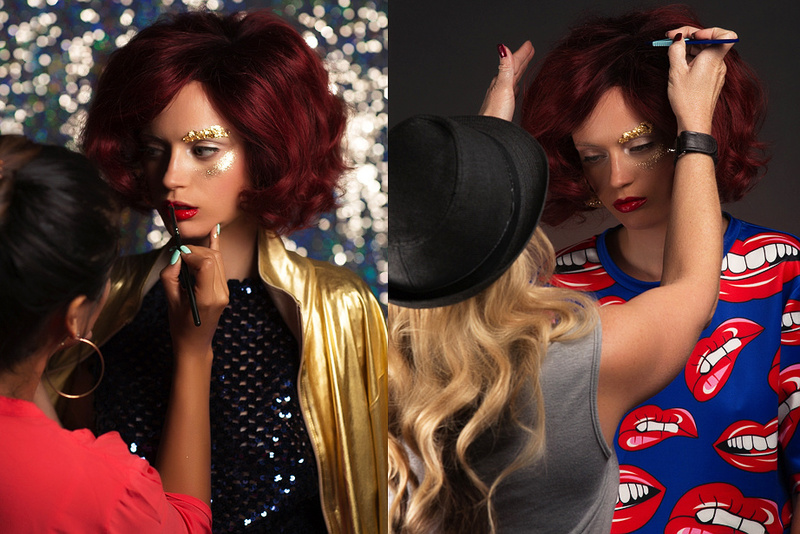 Often abbreviated as MUA, a makeup artist is vital for ensuring that your model is camera and retouch ready. A skilled makeup artist will know how to flatter your model’s features, as well as understand how the makeup will react to different lighting situations such as studio strobes. The benefit of a makeup artist is the time saved in retouching, and an aesthetic that they can produce for you in-camera. There are makeup artists who can specialize in other areas, such as manicures or male grooming. It is also not uncommon to find a makeup artist that can do hairstyling, making them that much more invaluable to your team. Properly styled hair is another very vital ingredient to fashion photography. Whether you are looking to have smooth hair, textured, wet, or zany, a hairstylist will make it possible. For studio work in particular, having a hairstylist can save you hours during retouching by smoothing out fly-aways so you won’t have to. You can’t have a great fashion photograph without great clothing. A wardrobe stylist’s first and foremost priority is ensuring that the hero of the story: the wardrobe, is shown in its best light. From steaming wardrobe to having the access to pull pieces from various designers and brands, a wardrobe stylist wears many hats. A skilled wardrobe stylist will guarantee that delicate and one-of-a-kind pieces are handled appropriately. They will also be aware of season-appropriate attire and trends, which is particularly vital when it comes to fashion editorials meant for publication. While there are other possible members of your creative team such as a creative director, prop stylist, and retoucher, the above three I believe are mission critical to any production. Fortunately there are quite a few different avenues for discovering local talent to add to your creative team. Below are the main avenues that have personally worked well for me. Model Mayhem is a social network for photographers, models, makeup artists, designers, wardrobe stylists, hair stylists, publications, and more. One of the largest networks when it comes to finding talent, this is one that I highly recommend for someone that is new to working with models or fashion images. There is an approval process for this site, so having existing photographs of people will be a must in order for your profile to be created. Through casting calls and the ability to browse for local talent with specific searches, Model Mayhem is a great platform for building your team. While a mobile-based social network that runs purely on photographs, Instagram has a lot of networking opportunities available. Tagging models and members of a creative team are very common practices for fashion photographers, which can make it easy to find local talent in your area. Search for hashtags related to your location and the desired role such as #newyorkmua or #newyorkstylist. You may be surprised at the people you find! While arguably the king of social networks, Facebook is a bit more challenging to utilize as a means of discovering talent. Where it can be useful is through discovering groups catered to your area and industry, as well as paying attention to the people credited in the images posted by local artists and professionals. Modeling and talent agencies are always looking for photographers for their new and developing talent to test with. A simple phone call to the agency asking to speak with the agent in charge of new faces is all it takes to get your foot in the door. This can offer some great opportunities for not only gaining access to local models, but for working with agency-tested and approved makeup artists, hairstylists, and wardrobe stylists. Building an effective team begins like any other working relationship. There are first impressions and there is the hopeful back and forth that will result in working together toward a common goal. When reaching out to someone you wish to work with, it is important to consider not only the compensation for the time provided, but of how the relationship can go further. Below are the most common types of compensation when it comes to working with a member of your potential crew. The collaborative bracket contains a lot of commonly used abbreviations and terms such as: TF, TFP, and TFCD. The general idea is that the professional will trade you their time in exchange for photographs delivered either digitally, or for print in the case of those that want physical photographs for their physical portfolio. A particularly effective means of testing with very talented individuals is for editorials that you are intending to submit to fashion magazines and publications. Tear sheets still hold a lot of weight in the creative world, and is a great way to compensate the efforts of your team with the achievement of having the photographs featured. An unpaid test is different from a TF shoot, for it is meant as a means of testing their skill without compensation, with intentions of hiring them for future projects once they have been proven. This term is most common when working with agencies, but is recognized by many in the industry. If you are unable to find creatives willing to collaborate, or are a photographer that is just starting out and wishing to expand their portfolio into fashion and beauty work, then hiring a professional goes a long way. This will allow you to create stronger images that can attract more skilled members to your team, and is a worthwhile investment. Regardless of the methods that you employ to begin building your creative team, the most vital piece of advice is this: deliver! Ensure that the expectations you have set forth for yourself are met, or even exceeded. This is the best way to guarantee that these key people will be a reliable staple in your future photoshoots. I couldn't agree more with the advice that good stylists and makeup artists cut down on retouching, a great many amateur photographers have this 'fix it in post' mentality. And that's coming from a retoucher! Thank you for the feedback! I'm glad that you agree with that sentiment. Retouchers shouldn't be the 'clean up crew' of otherwise controllable aspects that can be fixed during the production. I know the times I've lamented over something simple that could have easily been fixed on-set that took ages to fix in post, and I wouldn't put my retoucher through that if I could help it. I would love to work with agencies, but pretty much all of them in my state I consider very questionable business practices and many are just photographers using an agency to make money for photography in my state at least. I tried working with one and I was told I have to make a minimum deposit of $500, which is understandable as agents only make 10-15% commission. And as for legit agencies they are generally overwhelmed with already set list of photographers, at most I can send my info maybe get a call a year or two later if I keep my work fresh in their minds. Not trying to discourage just stating my experiences with agencies. Any agency that charges a photographer for test shoots is NOT an agency you should ever do business with. Charging for commercial shoots where there is a budget provided is a different story, but for any test shoots where the agency intends to use the images for the model's portfolio, or have the model gain experience with a different photographer, that is absolutely not something you should be charged for. Even charging for editorials is something you should stomp your feet over. You are right to avoid agencies with those sort of practices, but there are many agencies who are not like that. I will say that e-mailing an agency is not a good practice, as I made that mistake when I first started working with them, and had every agency ignore my message. I instead called the same agencies a month later asking to speak with the agent for new faces and almost immediately heard back and have been doing tests and editorials with their models ever since. For agents, they want to ensure the person they send their young models to is someone trustworthy and personable, so your phone etiquette and interview abilities when you do meet with them in-person is vital. Despite the bigger agencies being in New York, they often have models who live outside of the city, so it's not unheard of to have access to great models a good distance from the main hub. Even then, I've had agency models travel 150+ miles to do a test shoot with me. There are a lot of politics involved with agencies, but that is the nature of a very competitive industry. So long as you're professional, timely, and produce the results that they're after, it's a lot easier to make new connections and grow with the agency. For me, as I advance my editorial work, most magazines require agency models, so I absolutely have to nurture those connections in order to book the right talent. I can definitely understand your frustrations, though! I've experienced similar things along with other photographers at the beginning, who can get a little discouraged by only being sent very young and very green models resulting in unusable images for our portfolios. I found that once the agent had more trust in me, I was able to request better talent, and commissioned editorials are an almost guarantee to good models. In the end, agencies are interested in what you can do for them, so they want great, simple images that showcase their models in the best light. What I do now for my more zany and styling-heavy editorials is to shoot clean beauty looks first, so the agent gets what they need, and then I can get what I need. Thank you for your comment as well, your feedback is always welcome! Happy to hear that, hope it helped! I know it was quite a wall of text, haha. Question regarding working with test models from agencies. Do you still have them sign an industry standard modeling release or just a verbal or written permission to use for your portfolio/promo? It depends, agencies rarely allow their models to sign releases, however I have had them sign for specific publications that required them. If you're booking through the agency, then run the model release through the agent for approval if you have to have it. If it's an agency model but you booked them directly through the model and outside of the agency, then definitely have them sign a release.